Mercury has always been the liquid of choice in barometers. But, with some ingenuity, water still works. The concept of Air Pressure arrived at almost the same time as the invention of the mercury barometer by Evangelista Torricelli - it was virtually impossible to have one without the other. And Part 1 of The History of the Barometer dealt with the refinement of the mercury barometer and the early use of the barometer and changes in air pressure in weather forecasting. The weather glass is a teapot like container, made of blown glass, with a wide body and a thin spout which is the only opening to the larger part of the weather glass. It is filled with water, preferably colored, to a little above the connection between the body and the spout. Rising air pressure will push the liquid back down the spout, whereas falling pressure will cause the water to rise in the spout, even to the point where it overflows. The weather glass was a useful predictive tool for farmers and sailors, as a falling level in the spout indicated increasing pressure and generally fine weather, and the opposite suggested approaching rain and storms. The severity of the approaching bad weather was indicated by the rate of change, and by a rise in the level to the point of overflow. This was a useful rule of thumb, but it is not known when the connection to changes in air pressure was made. 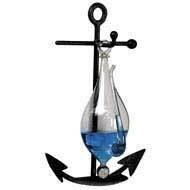 The weather glass was a fine forecasting tool, particularly when used with a weathervane and observation of the skies. 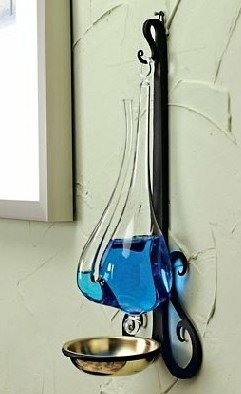 Its problem was that it couldn't be reliably calibrated and it was almost impossible to compare one weather glass to another. Other problems exist with using water to measure air pressure - evaporation and freezing. Weather glasses are still made today, mainly for decoration, and make an excellent companion for a home weather station or analog barometer. Amazon has quite a good range from associated suppliers, while Boater's World has an attractive weather glass as well as many modern barometers. In contrast to weather glasses, the advantage of a mercury barometer was that it was actually measuring something, and the measurements were easy to duplicate in other instruments. So there's a good place to step away from the history of the barometer. A lot of development took place over the next 200 years, particularly in surveying, where it was used as an altimeter, and in various navies. But the problem with the difficulty of using and transporting a large instrument with a mercury reservoir was never resolved. The next article reveals where, when and how the next breakthrough in the history of the barometer came. It deals with the Aneroid Barometer, with several other offshoots thrown in. Ever thought of using a leech barometer? You can also find information on Setting and Calibrating Your Barometer, and Home Made Barometers elsewhere in this site, together with reviews of Modern Barometers. This link will take you back to the Top, or, when you're ready, here's how to return to the Home page.